Instead of frying chicken wings today, I wanted to try baking some chicken wings to be “healthier.” Maybe it really isn’t that much healthier, but at least it wouldn’t be deep fried. 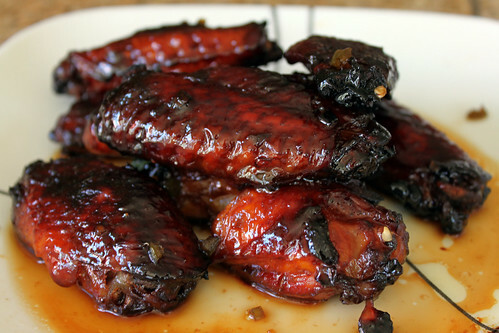 I looked around various blogs and stumbled across a Cola Glazed Wings recipe from http://www.steamykitchen.com. WOW! Chicken wings marinated in a Coca-Cola glaze with jalapenos, lime juice, and sugar. Plus, it was baked. So I decided this would be the perfect wing recipe to try. I did a few things differently, but I thought it turned out pretty tasty. The wings were nicely glazed, spicy and sweet, but not very salty like other wings I’ve eaten. You can definitely taste the Coke flavor in the wings. If you are a Coke fan, this is a must try! I wonder how this recipe would taste if I used Dr. Pepper, Root Beer, or Mr. Pibb instead? Maybe someone can try it and let me know! Preheat oven to 350 degrees on Bake. Prepare wings, season with salt and pepper to taste, and put in a large bowl. In a saucepan, combine cola, brown sugar, soy sauce, chilies, and garlic and whisk on Medium until sugars are dissolved. Pour 3/4 of coke-glaze to the bowl of chicken wings. Marinate chicken wings in coke-glaze until oven is pre-heated. 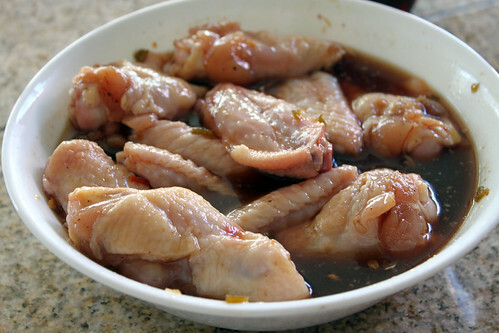 Add marinated chicken wings and liquid to a baking tray. Bake for half hour and flip wings cook on other side for another half hour and continue flipping wings every 15 minutes until chicken wings are cooked. 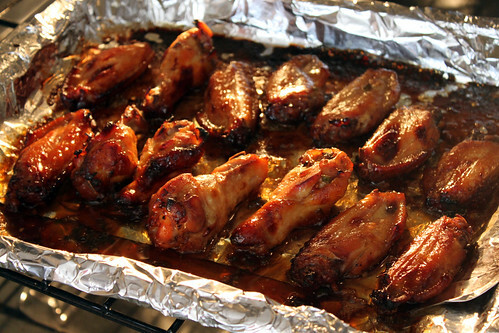 Take chicken wings out of the oven, put on a platter, drizzle rest of sauce over wings, and serve.